Volunteer Form - Become A #Berwynner! Website: Check out their Facebook page! Your Talent. Our Stage. Bring a friend or sit in with another musician. 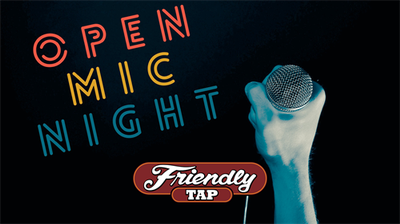 Join us at Friendly Tap for Open Mic Night every Wednesday night. Sign up will begin at 7PM every Wednesday, and the show will start promptly at 9:00PM. Wednesday nights. Sign up begins at 7:00pm. Music starts at 9:00pm. © Copyright 2019 Berwyn Development Corporation. All Rights Reserved. Site provided by GrowthZone - powered by ChamberMaster software.